I remember pressing my nose up against dirty glass from the outside when I wrote about the abandoned Co-op department store on Brighton’s London Road. My own hope was that Brighton & Hove City Council would sell its palatial (well, on the outside anyway) seafront office – King’s House – and move into the Co-op. But this was not to be. It is now being torn down to make way for 351 student flats. A chance meeting with acoustic consultant Daniel Goodhand, who certainly has his work cut out on this rather large demolition project, led to an introduction to project manager Simon Cowell from Watkin Jones, the Bangor-based developer of the scheme. Simon kindly agreed to a tour. Once I had donned hard hat, steel toe cap boots and high visibility jacket, I was ready to go. I recall just a single trip into Co-op when it was actually trading and I remember nothing in the way of historical features. I imagined that the building consisted simply of a façade, with unremarkable concrete expanses behind. We began the tour on London Terrace behind where two huge, and quite life-like, caterpillar-tracked demolition vehicles were tearing apart the rear or the building like steel dinosaurs. We slipped past them and headed towards the basement. It was on the winding steps down that I saw an intricate array of blue and orange tiles in what I identified as an Aztec theme. 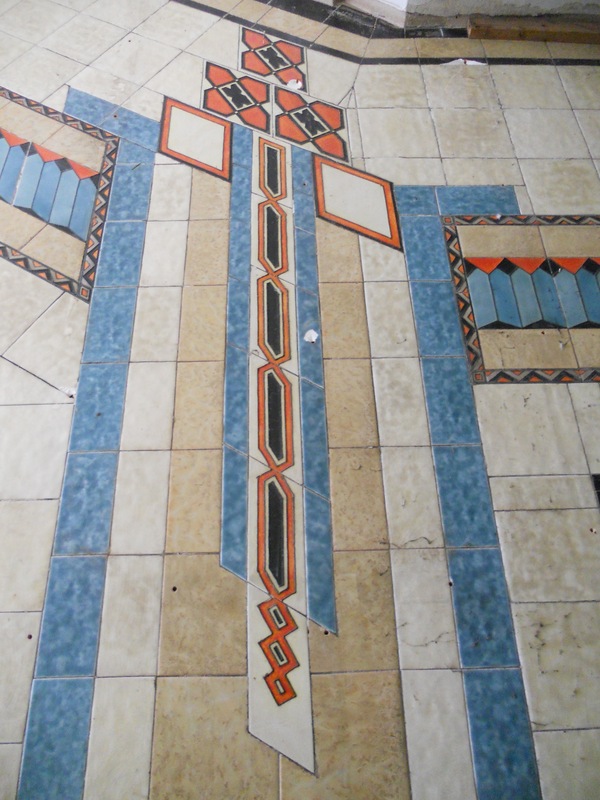 An Aztec influence would fit with the building’s Art Deco heritage. It was built in 1931 to the designs of Bethell & Swannell. The wide façade features huge fluted Doric columns and will soon be held up by scaffolding alone. Although it is to be retained, it will be left separate from the new structure by means of a narrow void. 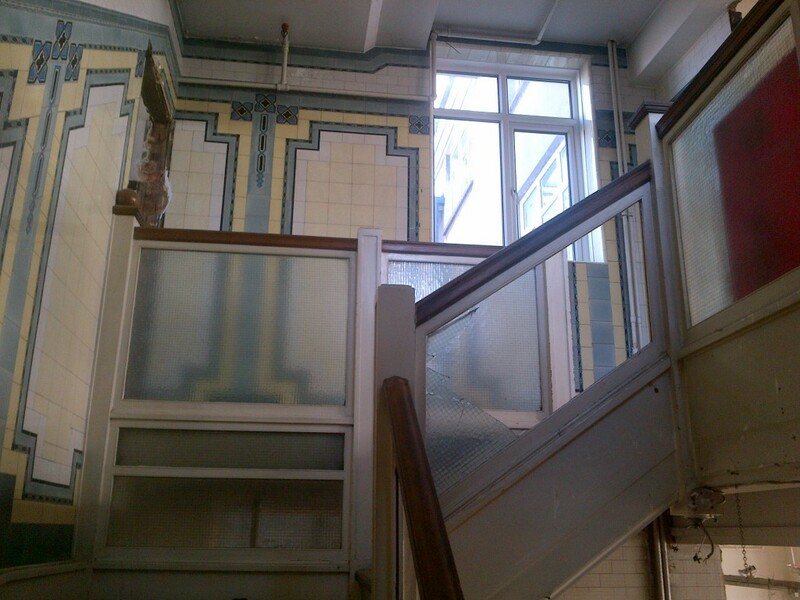 The stripping out of the old store is well progressed so many original features are on display including tiled floors which had been hidden for years. An old vault sits empty, save for a few locked safes beside a large bunch of keys. Rows of toilets sit beside each other without cubicles. Old signs remind staff that strangers could be thieves. I could have happily spent hours investigating but I am grateful to have had this rare glimpse. It will almost all be gone soon so that the new building can rise from the ashes – in time for an August 2014 completion.